And that’s pretty much all there is to it. 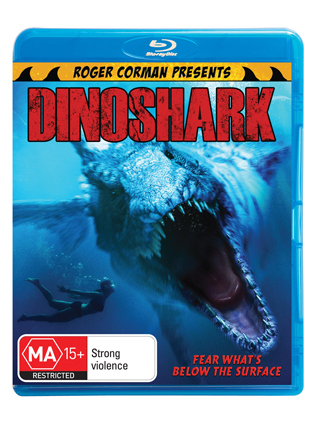 The latest low-budget monster outing from venerable schlockmeister Roger Corman, whose recent films include such similarly-themed fare as Dinocroc and Sharktopus, Dinoshark revels in B-movie cheesiness and incorporates all the hallmarks: hammy acting, bad dialogue, unconvincing effects (think sausages as intestines), extensive use of stock footage and a wilful, if tongue in cheek, adherence to its singularly silly premise. The Dinoshark proves impervious to bullets and other manmade weaponry and the gang’s attempt to destroy it, usually whilst clad in revealing bathing costumes and spouting nonsense in unconvincing Spanish accents, provide much of the dramatic impetus. Such as it is. The film won’t win any awards for, well, anything, but it does have a number of truly funny moments and ultimately proves highly enjoyable in an Ed Wood, guilty pleasure kind of way, providing you can look past the terrible CGI and even worse acting and also suspend your disbelief to the point where it becomes but a distant speck on the horizon. Carol: I teach environmental science with a focus on aquatic ecosystems. Luis: Big words. Let’s drink! In the way of Special Features there’s an Audio Commentary with Producers Roger and Julie Corman and Director Kevin O’Neill. The Cormans are in typically good form and O’Neill is full of interesting titbits and insights into the shooting process – one of the more enjoyable audio commentaries of the past few months, methinks, and a worthwhile compliment to the absurdity of the feature itself.